I’m sure at this point in my life (43! ), it’d be perfectly acceptable to call you John. Not me, though. I didn’t belong at Shippensburg. I mean, from a social perspective, I did. But in high school, I graduated at the top of my class. I had certain accolades: Salutatorian, President of Mathletes. I guess that was about it, but anyway. I should have gone somewhere like Bennington, and then I would have ended up famous like Bret Easton Ellis or Donna Tartt. (I just heard they’re making a Goldfinch movie). Thing is, I was the first person in my family to attend university. My parents were proud of me and they trusted me to make good decisions. They told me I could go to any college my heart desired, and when I said I wanted to go to Saint Joe’s, they reminded me I’d commute, because Saint Joe’s was very expensive and it was a 10-minute bus ride from our house. That taught me two things: A. I wanted to go away for college and B. My budget was small. So I chose Shippensburg. I don’t know why you chose Shippensburg. You didn’t belong there, either. One day, you stopped me as I was leaving your classroom. You looked down at my hands and made this quiet snort that you sometimes made when you saw humor in something literal, and although no one else seemed to know why you made that sound sometimes, or maybe they didn’t notice it, I always knew when you made that sound, there was a nugget in that moment. Anyway, you looked down at my hands and made that sound and with a very genuine smile you said to me, “Cocaine finger?” I looked down at my hands and realized that I still had one artificial nail remaining on my right pinky finger, one artificial nail that still hadn’t fallen off or been peeled off by me after the Sorority Formal the previous Friday night, for which I had procured a black velvet cocktail number, freshly dyed my hair (my signature platinum blonde), and glued a Sally Hansen French manicure to my fingertips. I never forgot you noticed that. (I’ve been looking for things like that ever since). Another time, this was at the end of my senior year, I was leaving your Creative Writing: Fiction class. I didn’t need that class to graduate. I could have taken four classes that semester to have all of my required credits. You probably didn’t know that. It was a case of “I have one more chance to take Taggart” not “I got Taggart.” But anyway, on this particular day, I read a short story aloud to the class. I can’t remember if I volunteered it or if it was my turn. I think it was my turn, though. It was an exercise in Metafiction. After the class ended, you pulled me aside as I was leaving and said, “Do you have somewhere to be right now? Can you drop into my office in five minutes?” And my heart kind of stopped. In your office, you asked me what I planned to do after graduation. I said that temporarily, I had an administrative job lined up at Roxborough Memorial Hospital, which was a good start. But I was planning to apply for jobs in the paper. (I mean, in the Classifieds, which I feel I need to explain now because younger people would think I meant a journalism job but what I meant was I’d look in the Classifieds section of the paper for a job. But that doesn’t matter, because you knew what I meant). I think you should know what became of me. I got a job in the paper. I became a Marketing Professional. I took time off work to have babies. I experienced a sloppy divorce. I ran in some races. I made a lot of money in Advertising Sales. I bought (and sold) a few houses. Eventually, I remarried. All the while, my parents have been proud of me and have trusted my decisions and still live a 10-minute bus ride from Saint Joe’s. 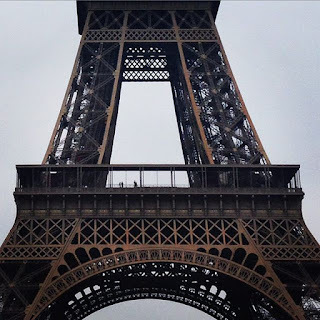 A year ago, I moved to Paris. Now come on, even you have to admit, Paris trumps New York. I didn't exactly plan it this way, but however it happened, I am writing here full-time. When I think I don’t belong here, I re-read my short story, the one I read in your Creative Writing: Fiction class (I don’t have an actual copy of it; I do my best to conjure it up), and I remind myself that I’m a good writer. Eventually, I’ll have proof of this. And when I do, I’d like to send it to you. Except I don’t know where to send it and that would be a little creepy too. So instead, well, this letter. Posted on the Internet. Even profound people like yourself occasionally google their own names. I mean, not often, of course, but occasionally. What I’m saying is: Thanks, Dr. Taggart. John. John Taggart. He was my favorite professor too.